Made for the Guild of Smiths; on the stem are smiths at work. Cup of silver parcel-gilt; embossed and chased; leaf-shaped bowl embossed with scroll foliage; curved end with figure of a smith, in front of him is rosette from which proceeds a vine leaf embossed with grapes, forming a cover to the bowl; stem of oval base with three smiths hammering at anvil; in front is medallion, painted in enamel with coat of arms, eagle displayed; foot embossed with interlacing vine leaves; inscribed. Origin: Augsburg; dated 1690; mark of Marx Weinold (master c.1665, died 1700). (i) Assay mark for Augsburg, 1685-1700 (probably R3 186), or Seling 142(168g). (ii) The initials MW within an oval: the punch-mark of Marx Weinold (R3 726; Seling 1671). The two marks occur on the foot, stem, bowl and 'cover'. Commentary: The maker's mark has been identified in Seling 1980 as the punch-mark of the Augsburg goldsmith Marx Weinold, who is recorded in 1665 as marrying Anna Warnberger and is, therefore, presumed to have become a master shortly before that date. He continued his career in Augsburg and was married again in 1680 and in 1691; he died in 1700. In Rosenberg I, 1922, this punch-mark had been attributed to “Mattheus oder Markus Wolff” (died 1716), but that identification has been superseded. Marx Weinold has created a most impressive standing-cup in the latest taste and of the finest quality. The Baroque style has been most successfully assimilated into the traditional form of tall standing-cup, so popular among the guilds not only in Germany and Switzerland but also in England. This 1690 three smiths cup was published as a piece of plate belonging to the Augsburg Guild of Smiths (in Karl Gröber, ‘Alte deutsche Zunftherrlichkeil’ Munich, 1936, p. 81, fig. 84), and its spectacular sculptural quality is exactly what was required of plate that was intended for display on ceremonial occasions. It was probably intended to be seen from a distance on a sideboard or buffet during a Guild banquet or, possibly, on the High Table in front of the Master as a glittering ornament. The undulating and embossed surfaces of this parcel-gilt cup would, indeed, look well in the candlelight of those social occasions. The sinuous, curving form of the shell had become extremely popular in the second half of the seventeenth century, and on this standing-cup it has been effectively combined with the leafy-scroll Baroque ornament. A slightly earlier example of this new and very distinctive form by the Augsburg goldsmith Philipp Küsel is in Schloss Weissenstein, Pommersfelden (see Seling 1980, p. 277, pl. 410, where it is dated “um 1675-79”). The introduction of a single figure into the stem of these tall German standing-cups (see Hans Petzolt's tall Bacchus standing-cup and cover in the Waddesdon Bequest, WB.103) was frequently attempted by goldsmiths throughout the late sixteenth and most of the seventeenth centuries, but often with far less harmony and success than in Marx Weinold's complex design of 1690 for the three smiths cup, where the figures are each characterised and modelled with skill and ingenuity. 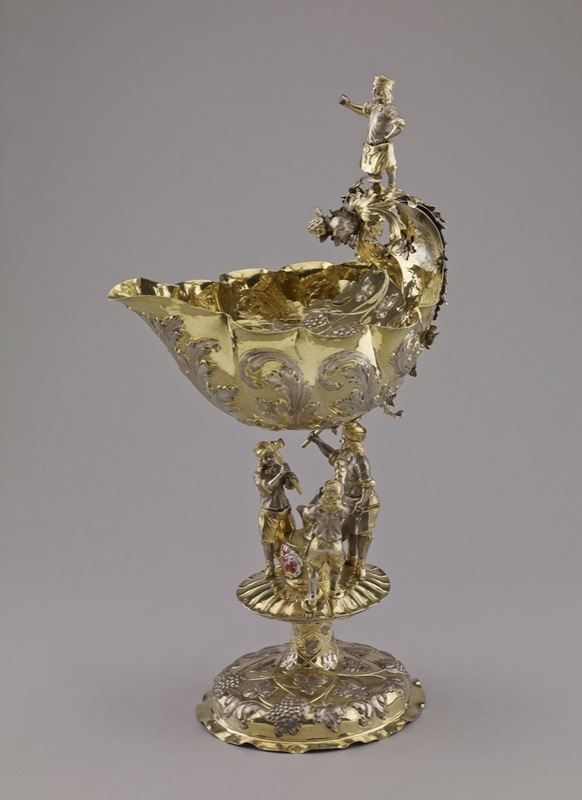 Few, if any, strict parallels can be cited, though one similarly ambitious attempt to create a stem composed of several sculptural figures has been recorded: it is a ewer (with basin en suite), executed in the Augsburg workshop of the Jäger family, and presented by Charles II, King of England, to his godson Charles Clifford and mentioned in a letter dated 4 July 1670. It was lent by Lord Clifford of Chudleigh to the ‘Age of Charles II’ exhibition, Royal Academy, London, 1960 (no. 380, with illus. ; see also Seling 1980, p. 261, pls 270-1, where it is dated “um 1660-70”). The Jäger ewer, 48 cm high, has a stem depicting the violent movement of a soldier seizing with one hand the child from its kneeling mother while holding his sword poised in the other hand. The vigorous three-dimensional Baroque quality of this figure group is brilliantly integrated into the overall design of the ewer, the cover of which is surmounted by another free-standing figure - just as on Marx Weinold's almost contemporary cup, where at the apex the fourth smith dominates the scene. Marx Weinold's asymmetrical design of the three smiths cup has achieved a sophisticated balance which gives it a commanding presence, so necessary for a display item of plate belonging to a guild. Hugh Tait, 'Catalogue of the Waddesdon Bequest in the British Museum, II : The Silver Plate', British Museum, London, 1988, pl.XVI, no. 54, figs. 305-309.